For Immediate Release: Posted On 6/28/2011 By Industrial Magnetics, Inc.
Quickly activate holding on beams, buildings, truck- beds, or ships by placing the magnet on a clean steel surface, pushing the handle slightly down and rotating 180° to turn the magnet "On”. The handle can be used as either a hook or a cleat for easily fastening your object with grommets or ties. To remove, simply reverse the steps to turn the magnet “Off". Performs best when mounted on a clean steel surface that is at least 1/4" thick. Multiple holding strengths are available based on application requirements. 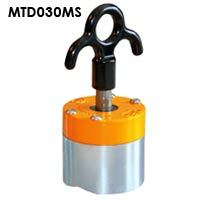 Visit the magnetic tie-downs page for more information and to order online.